How does good store lighting affect customer experience and sales? Retail experts are always interested in things that can improve both. These days a good customer experience is not a game of luck, but the result of careful planning. Well-developed store concepts direct every move that big retail chains make, from materials to colours, shelf and aisle placement to, yes, lighting. All of these aspects aim to improve the store’s retail value. In this article, we will explain the foundation of effective store lighting and how to use it to boost sales. You will also learn how easy it is to utilise smart lighting solutions in stores – now more than ever – and simultaneously create more revenue and savings. Read more about the opportunities. Despite all the possibilities, stores rarely consider lighting from a commercial point of view. Instructions often only specify a “light in the ceiling”; it illuminates but does it improve customer comfort and in this way serve the ultimate business goal, sales? Your aim should be a retail store where lighting has been harnessed to serve the store concept and improve sales. A well-lit store is comfortable in every way. Lighting points should be set at the right height and the light should be distributed well. There should be enough light and contrast. However, in reality the implementation often looks different. Imagine that your store invests in new, expensive furniture. In reference pictures they look amazing, but after assembly they just look bland and gloomy on site. The reason is wrong lighting. While investing in new store furniture, renovating the store lighting at the same time is often a commercially smart decision. That’s why lighting should be an integral part of a store design plan. Light guides customers’ eyes. Correctly distributed lighting gets customers to look up from the floor and the furniture and towards vertical surfaces and products on the shelves. By using lighting to highlight products, customers notice them better. This is how lighting can improve sales – by guiding customers to look at what you want them to see, the products on sale. It’s also important to keep in mind that the customer experience – and creating the right atmosphere – starts even before the customer has entered the store. Inside, comfort is a key value; outside it is security. Lighting can help you with both. Image: During lighting renovations at Käyttöauto Kokkola, both interior and exterior luminaires were changed to energy-efficient LED luminaires. The new outdoor luminaires are Greenled’s Sirius M series. For instance, the parking lot requires good, stable lighting. In the middle of the night, the luminaires can be slightly dimmed. This helps the store conserve energy and avoid drawing unnecessary attention to the parking lot. With luminaire-specific control and motion detectors, luminaires can be programmed to illuminate at full power if they detect movement to capture good-quality security footage. Modern smart lighting solutions make this easy. Improving lighting is a natural starting point for boosting sales. It’s essential to consider the importance of optics, illuminance, light distribution, colour temperature and rendering of colour. The following tips can significantly increase your chances of designing great store lighting. From a commercial point of view, choose store lighting that highlights vertical surfaces as well as possible. However, don’t forget to consider your property’s special characteristics. In addition to highlighting products on shelves and aisles, floors also need sufficient lighting. The so-called Batwing optics distributes light quite evenly between the floor and vertical surfaces. The width of the optics highlights vertical surfaces while being narrow enough to avoid glare. Batwing optics are usually an ideal solution for aisles when you want to highlight products on the shelves; they help improve illumination by approximately 100-200 lx. Image: Batwing optics highlight products on the shelf. Batwing has its own restrictions. For optimal results, Batwing should be installed at a height of 3.2-3.7 metres. Luminaires that are located higher than this should utilise wider optics or asymmetric optics near walls. 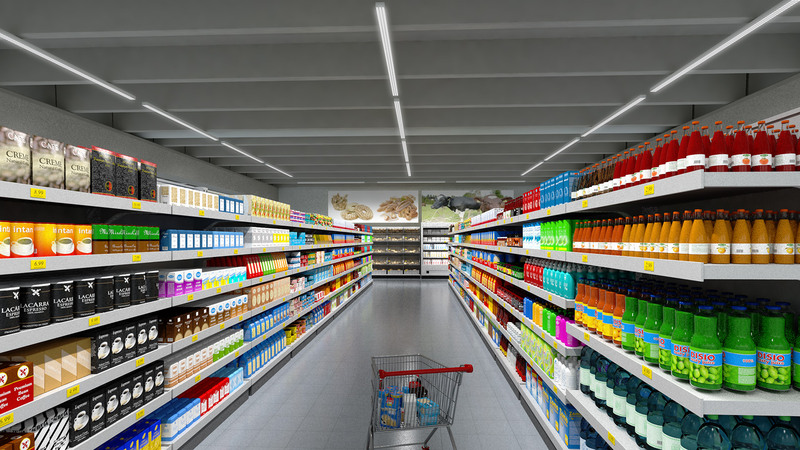 Especially in bigger supermarkets, it is essential to make sure that your optics are not too narrow so that the vertical parts of shelves are illuminated well. Wide optics provide reasonably good lighting even from a higher mounting point. However, they come with their own set of problems: optics that are too wide might cause glare. And, that is something you want to avoid. The higher the lighting points are located, the less they help highlight products and guide customers. Consider lowering ceiling lighting to create a better atmosphere and thus a better customer experience. Lower-hanging lighting highlights furniture and products as well as makes the space more comfortable; retail store spaces can sometimes resemble industrial halls without good lighting. High-placed lighting can create general lighting; in this case, use spotlights to create 1/3 or 1/5 contrasts. Similarly, you can use upward directed optics to illuminate the customer area behind the registers and create a spacious feel. In addition to light output and light distribution, you should also consider the colour temperature. Colour temperature is measured in degrees of Kelvin (K). The lower the degree, the “warmer” the impression. Market concepts usually utilise the neutral colour temperatures between – 3,000 and 4,000 K.
However, what is even more crucial than the colour temperature of the lighting is how the lighting renders colour. Colour rendering refers to light’s ability to render the colours of its environment – for example, skin colour – naturally and correctly. Obviously, this is a commercially important aspect of lighting design since good colour rendering presents your products as natural and attractive. Colour rendering is expressed with a CRI rating; usually, stores aim for ratings higher than 80. However, it’s important to note that the CRI only shows soft colours on a scale of 1-8. At this moment, the full-colour scale 1-15 is not actively in use, and the CRI rating of red light (R9) should be more than 90. Some products, such as vegetables, can benefit from a CRI rating higher than 90; the amount of red light (R9) is especially important and it is usually relatively low in LED lights. Store lighting can easily be tailored to your store’s needs in regards to colour temperature and colour rendering depending on the purpose of the luminaires and the object of the lighting. Always rely on professionals to help you successfully set up your store lighting. Let’s talk about lighting control. Choosing the right optics and luminaires is an important part of the design process; However, they need a smart control system to take them to the next level. Lighting control can improve sales, customer experience, lighting costs and luminaire life-span. Smart lighting = lighting that you can control. Controlling your lighting solution allows you to optimise the store lighting for many purposes. The lighting can be optimised based on zones or even aisle-by-aisle, depending on space design and the products on the shelves. A smart lighting system also helps you improve the customers’ shopping experience. Sensors can detect movement in areas and adjust light accordingly. 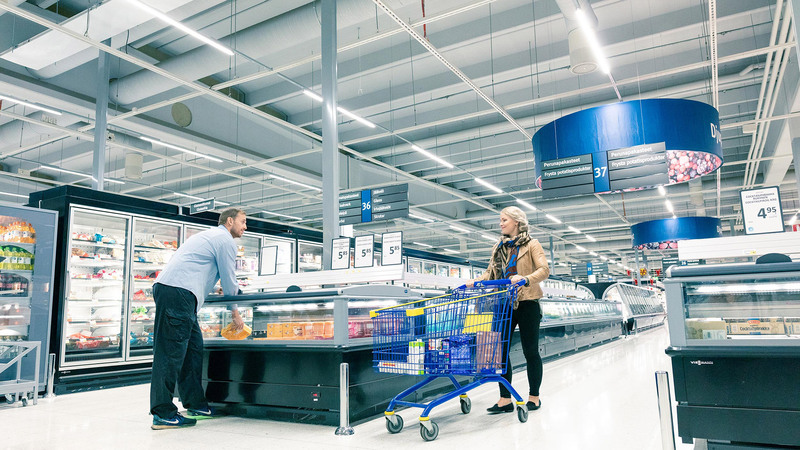 Lighting is utilised to serve the customers and manage their actions in the store. The role of smart lighting control changes – it creates ambience and shows that your store is environmentally conscious. 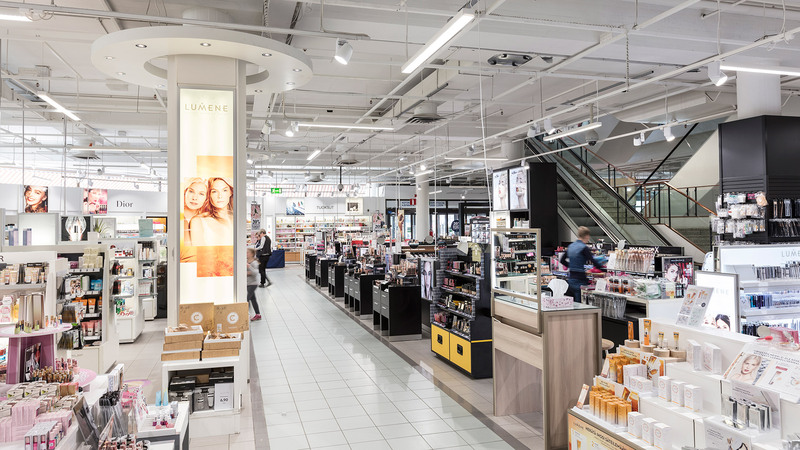 By optimising store lighting, you’ll reach maximum energy savings like in Sokos Joensuu mall – as a result, smart lighting decreased energy consumption by 70%. 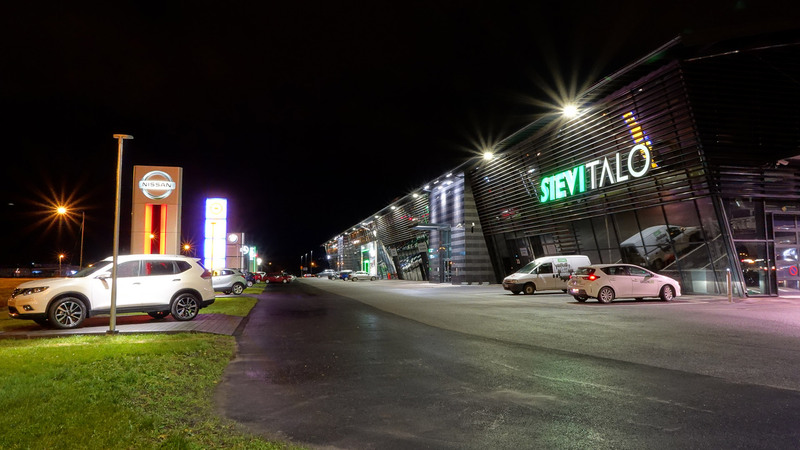 Image: Sokos Joensuu mall uses Greenled’s modern LED lighting. Store lighting can also reflect the time of day or the season. For instance, you can adjust store lighting to reflect daylight so that the customer isn’t blinded by it when they enter the store. You can install motion detectors in storage facilities and loading docks to avoid unnecessary energy consumption. While the store is closed the lighting can be dimmed, however not completely turned off for cleaning and stocking shifts. Smart lighting management also gives valuable information on store lighting in real time. The system creates maintenance reports of the hours that the light sources and drivers have been on as well as precise energy reports among other things. Load shedding can also be integrated into a smart system. The information provided by smart lighting can be used for commercial purposes and to improve property management. Both need to be taken into account in choosing the lighting control system. Let’s look into the future – how can smart lighting be utilised in a more general sense? Smart store lighting is the first step towards an integrated, smart property. IoT (Internet of Things) is already being used in property management. IoT in property management = saving, analysing and utilising information gathered at the property. In a nutshell: on the property, sensors gather an incredible amount of data on things such as customer movement in the store, the level of garbage in bins, energy consumption of luminaires and the length of queues. A staggering amount of information can be collected from one property alone. Data can be endlessly saved and analysed. The more data you have, the better your options are. Combining information from all stores in the same retail chain, the data can be used to make important decisions about both retail and property management. Collecting information, analysing it and utilising it in the decision-making process benefits your business directly and gives it a competitive edge in the long run. Smart property = a property managed and optimised by data information. At the moment, businesses are using singular smart solutions. Within the next decade, most businesses are likely to start using more holistic solutions and creating real smart properties. Smart properties can control cost management, fire safety, water, temperature and air-conditioning – and naturally, lighting. Since lighting is everywhere, it is a good way to start creating a store controlled by smart technology. Controlling different activities in a smart property is easy. Reports cover different functions thoroughly (energy consumption, temperature, humidity, etc.) and future maintenance operations are easier to predict and plan. The thought of an incredible amount of data might feel strange. What is data even good for? You can answer this by turning the question around: which property related problems would you like to know about before they happen? Often the only other option is to adjust settings afterwards or set them completely based on guess-work. Lighting is needed everywhere; but does it serve its purpose? Store lighting is a complex issue; many questions and choices have an effect on it. Wise decisions can boost your sales while poor choices can have the opposite effect. If you want to use lighting to improve sales, choose a reliable partner that understands the importance of sales. Our long-term expertise and thorough knowledge of lighting guarantees that we can help you get the results you want. Lighting technology has taken great strides in the past few years. It is good to keep an open mind as you get to know your options. Your first step towards creating a smart property might be surprisingly easy to take. A reliable partner can also offer you financial advice. In the past, lighting has been considered a big investment. Nowadays, it can often be purchased as a monthly service. In this case, the same company takes care of lighting design, installation, programming – and maintenance. Interested? Please don’t hesitate to get in contact – our experts are here to help you! This article only scratches the surface of all the options and possibilities that lighting can offer your business. Subscribe to our newsletter to receive interesting articles, case studies and information on lighting directly to your inbox!